What Are Your Carpet Cleaning Needs in Lake Stevens, WA? Not all carpets are the same, some are hard, some are soft and plush and many of them are very thin. Depending on the type of carpet you have your methods for cleaning will be different. Sometimes though it seems that no matter what you seem to do, your carpet will just not get clean, or at least not stay clean for very long. 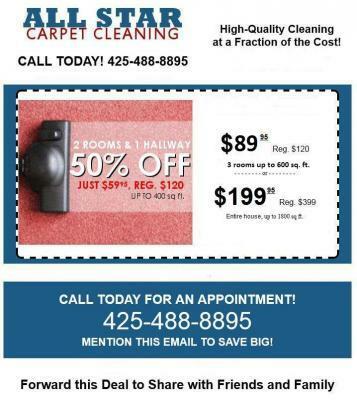 Whether it is for your business or your home your carpet cleaning needs in Lake Stevens, WA are important to us. We understand how difficult some carpets can be and that is why we have spent years in developing the right system to get all types of carpets cleaned. For us those carpet cleaning needs in Lake Stevens, WA are a breeze, and while it might look simple when we are cleaning and treating your carpet it took time for us to get where we are. We take pride in getting your carpet clean and free of germs, allergens and anything else that might be hiding within your carpet. Instead of constantly struggling with trying to get that carpet clean, by using vacuums or even a steam cleaner, let us handle those carpet cleaning needs for you. We can come in and take a look to see what type of carpet you have, giving you an estimate not only on price but how long the job will take. This way you will know right away what is going to be involved in order to get your carpet looking its very best. We make it our goal to satisfy each and every customer every time we do a job. And your satisfaction is important to us when we take care of your carpet for you.